Bioshock Finite: is this the end for the luscious Bioshock universe? 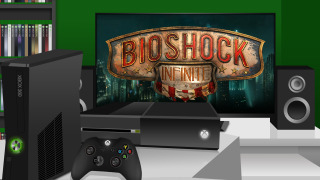 Will Bioshock continue into Infinity? Well, that was unexpected. Ken Levine, co-founder and creative director of Irrational Games, announced this week via a blog post that he was "winding down Irrational Games as you know it." Levine is often seen as one of gaming's few auteurs. A visionary that brought us the beautiful and complex worlds of Rapture and Columbia via the award-winning Bioshock franchise. And yet, his announcement still struck me as an oddly egotistical speech. It deals mostly in I's and me's even as it coolly explains that more than 100 hard-working people are suddenly out of a job because of one man's desire for creative autonomy. Columbia: surely this won't be the last we see of such sumptuous worlds? "While I'm deeply proud of what we've accomplished together, my passion has turned to making a different kind of game than we've done before," he says. "To meet the challenge ahead, I need to refocus my energy on a smaller team with a flatter structure and a more direct relationship with gamers. "In many ways, it will be a return to how we started: a small team making games for the core gaming audience." "I am winding down Irrational Games as you know it. I'll be starting a smaller, more entrepreneurial endeavor at Take-Two. "That is going to mean parting ways with all but about fifteen members of the Irrational team. There's no great way to lay people off, and our first concern is to make sure that the people who are leaving have as much support as we can give them during this transition. "In time we will announce a new endeavour with a new goal: To make narrative-driven games for the core gamer that are highly replayable. To foster the most direct relationship with our fans possible, we will focus exclusively on content delivered digitally." Rapture: Down where it's wetter, down where it's better? "'Narrative driven games' and 'highly replayable' are two phrases that just don't go together"
Now I wish Levine and his team nothing but the best of luck in their new project, regardless of whether I think it's right to disband an entire studio's worth of people. But "narrative-driven games" and "highly replayable" are two phrases that (traditionally at least) just don't go together. Once you've experienced or completed a story, why would you feel compelled to return to it - especially given Levine's Shyamalan-like penchant for plot twists and surprise endings? Unless he means to pursue something like Telltale's games with their branching narrative structure, perhaps? That would also certainly work with a digital distribution model too. Anyhoo, I'm getting sidetracked. Overall, Levine remained pretty vague about his next game, but he did confirm that he and his elite team of fifteen or so employees will be staying with 2K to make it. That is, presumably, whilst he continues to make his big break in Hollywood by penning the script to a remake of Logan's Run. After the initial swell of concern for Irrational's former employees, who to be fair sound like they're being taken care of (in the job recruitment sense, not in a mafia sort of way), your next thought should surely be whether Irrational's "winding down" will spell the end of its most successful franchise. The announcement comes just ahead of the release of Episode 2 of the Burial at Sea downloadable add-on for BioShock Infinite, which may well tie up any narrative loose ends to the franchise that began with the original BioShock in 2007. Could this really be the last we see of the Bioshock universe? Thought the Bioshock series was just about shooting stuff? Think again. For Infinite, many of the conflicts are based around the concept of American Exceptionalism, whereas the original game's Rapture was built on character Andrew Ryan's capitalist beliefs. The series also explored themes of scientific discovery through the ages; in Bioshock, Tenenbaum echoes the scientific research being done with DNA during the 1950s and 60s by real-life pioneers like Francis Crick & James D. Watson. Bioshock Infinite, on the other hand, explores quantum physics, drawing on the work of people like Albert Einstein and Werner Heisenberg in the early 1900s. "I thought Bioshock Infinite was a case of over-egging the pudding; a game not quite as clever as it thought it was"
I'm guessing not. In his blog post, Levine confirmed that he was "handing the reins of our creation, the BioShock universe, to 2K so our new venture can focus entirely on replayable narrative." Look, see, there's that phrase again. Anyway, Bioshock Infinite may have been a GOTY contender, but its protracted development - the game took the team approximately five years, all told - can't have been easy on 2K's bank balance, and feels like further proof that lengthy, triple A development cycles just don't work any more, no matter what studio is behind it. That said, Bioshock has always been a critical darling and as such it's unlikely that the publisher will allow the series to go gently into that good night. What's more likely is that it'll recruit 2K Marin, the studio behind Bioshock 2, to carry on Levine's legacy without him at the helm. And it may be a very different series, sure; Rapture was a singular and fascinating creation that Levine built on Ayn Rand's philosophy of objectivism, slathered in Art Deco architecture and set 20,000 leagues under the sea. But personally, I thought Bioshock Infinite was a case of over-egging the pudding; a game not quite as clever as it thought it was, and a change of hands might do the franchise a world of good, if indeed the studio that takes it on is up to the task. At the end of the day, Bioshock may have been his creation, but Levine is only one man, and it takes a team of hundreds to create something like Rapture. There's always a man, there's always a lighthouse. As long as those two things align, there'll always be a Bioshock. Will the PS Vita Slim be Sony's last handheld console? Has Gears of War killed this hot new Xbox One game?